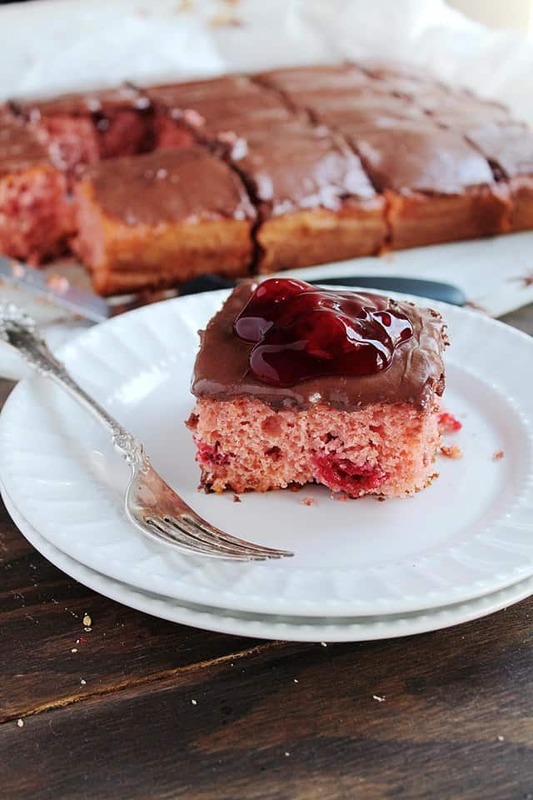 Quick Cherry Chocolate Cake – This delicious, simple chocolate cherry cake is made with a cake mix and cherry pie filling. It’s rich and festive, and perfect for your special occasions. Super Bowl just happened. That was nuts! I had to walk away for a moment after that second touchdown by Baltimore. I could not believe it! I also can’t believe they won! Congratulations, Ravens! I felt so bad for the 9ers. Anywhoooo. I’m about to turn your attention to the next big day – Valentine’s Day. Okay, so it’s not as big as Christmas Day or the Super Bowl, but it is a day where you are allowed to eat a ton of chocolate! And a day that calls for a ton of chocolate is a big day. First in line, a Quick Cherry Chocolate Cake! 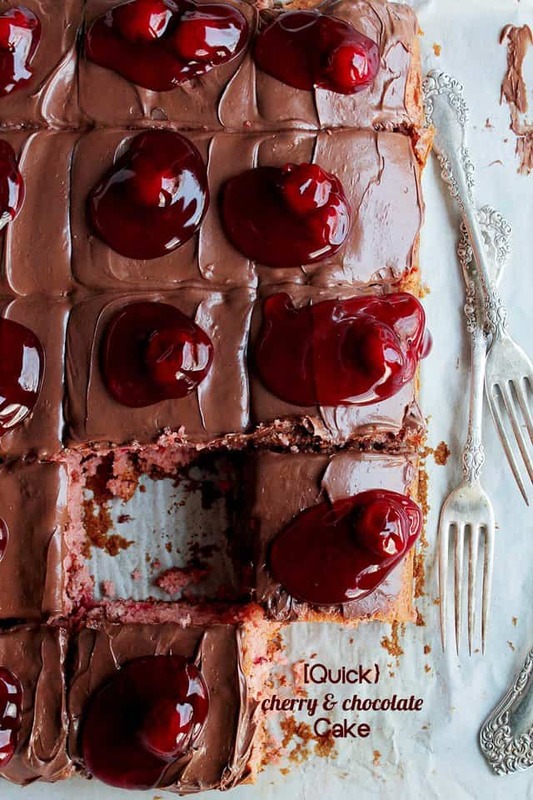 This cherry chocolate cake is easy, red and delicious… and quick. It also comes from a box. Yaaaay for boxed cakes when you need a quick cake! The very first time I made this, I made it for my Mom. She loves anything with cherries. After taking her first bite of this yumminess, she told me to call it, “The NOM and YUM Cake”. She described it as light, sweet, and cherrylicious. Sounds like a cupid-worthy cake to me! Now, I have to comment on the Super Bowl! What about that power outage? I thought that was funny. Someone forgot to pay their bill. 😉 At that moment, I turned away from the TV and walked straight toward the food. I lost myself in a sea of wonton chips, tacos, potatoes… and loud people…very loud people. My ears are still ringing. But still, it was glorious, wonderful and delicious. I hope you also had a wonderful time. And I also hope that your team won. Mine didn’t. Well, mine didn’t even make it to the Super Bowl, but we won’t talk about that… We should just discuss a cherry chocolate cake, instead. If you have a few minutes to spare, throw this cake together and serve it to your sweetheart(s). Or yourself. I had 3 slices… no joke. Don’t judge!! I really like my cake! Lightly grease a 9x13 baking pan and line with parchment paper; set aside. In a large mixing bowl combine the cake mix, 1 can cherry pie filling, eggs, oil, and vanilla; mix until thoroughly combined. Pour cake batter into prepared pan and bake 35 to 40 minutes, or until a toothpick inserted in the middle comes out clean. Allow cake to completely cool before frosting. Combine chocolate chips, evaporated milk, butter and vanilla in microwaveable bowl. Remove from microwave and whisk until mixture is smooth. Spread it over the entire cake. Top the cake with the other can of cherry pie filling. This Chocolate Frosting works best if you spread it while it is still warm. If it cools off before you're ready to use it, put it in the microwave for a few seconds, remove, stir, and spread. wow this looks delicious!! yum! I pinned it right away! Oh this is such a great combination! That frosting sounds amazing too! Oh so sweet. Who needs a special day to enjoy this? Cherries and chocolate = happiness. Me, myself, and I would love this cake on Valentines Day…or any day! 😀 Beautiful- the pink and brown make a handsome pair. Chocolate cake and fast?! Yes! I love chocolate and cherry too. You can’t go wrong with that combination, and this cake looks divine. And so easy! I love that part, too. HOLY AMAZING!!!!!!!! This may be the best cakes I’ve seen in ages! 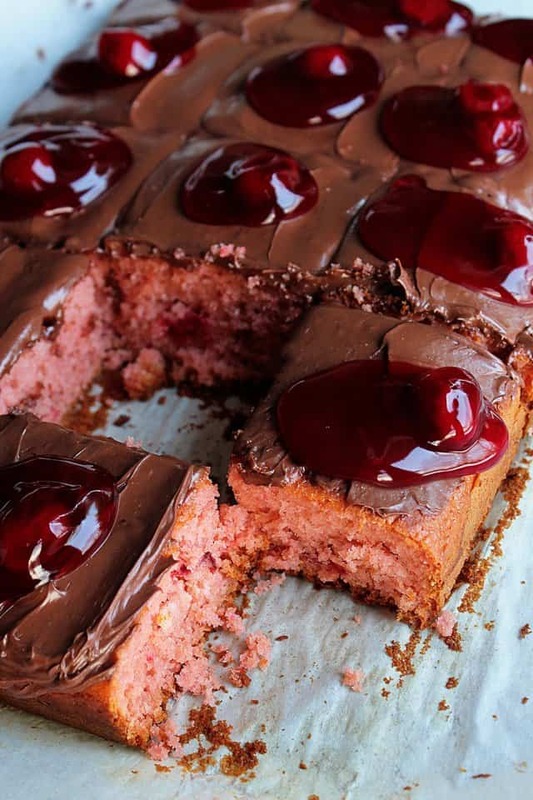 The frosting, the cake itself, the drippy cherries, I am in heaven. Pinning! 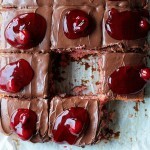 Chocolate and cherry are one of my favorite combinations! That’s great!! Thanks Ellen! Your version is healthier…I need to try it!